Canada is definitely involved in the online gambling market, and is home to one of the most respected and reputable online gaming authorities, the Kahnawake Gaming Commission. Prior to the 70s, Canada had rather stringent restrictions concerning gambling in general. Since that time multiple legislative changes have occurred that have allowed the gambling industry to become integrated into Canada's culture and evolve into a thriving part of the nation's economy. Canadian residents are able to legally enjoy online gambling from a variety of sources, including local government licensed online gambling sites as well as legitimate offshore gambling sites that are licensed and regulated abroad. However, there are some questions that frequently emerge regarding the legalities of online gambling in Canada. The gambling community in Canada also seeks information about effectively selecting an online gambling destination that is reputable, secure and offers a premium betting experience. This guide will focus on providing you with information on both of these topics that is accurate, up to date and applicable to your personal decisions regarding online gambling entertainment. Once you have insight into what is and is not legal for Canadian players, you can make informed decisions about your level of involvement with online betting. Our casino, poker room and sportsbook recommendations can assist you in locating a Canadian friendly online gambling site that is compatible with your personal betting preferences and objectives. Is Online Gambling Legal In The Canada? Canadian players should know that Online Gambling Is 100% Legal In Canada. As our laws section below explains, Canadian players can choose from local gambling sites located in Canada, or offshore sites located outside the country. Both are perfectly legal for Canadian residents. Bet365 is actually one of the biggest gambling sites in the world. They accept players from most countries and are licensed to accept Canadian players. They have an impeccable reputation for being fair and honest in the industry and also offer some of the fastest payouts (often the same day). 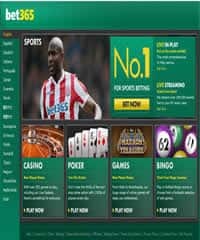 Aside from playing with one of the most trusted sites, Bet365 is known for offering players the most robust gaming platform in the industry allowing players to enjoy real money casino games, poker, sports betting, bingo, scratch cards and more all under one roof. There are a number of online casinos based in Canada that have been licensed by individual provinces within Canada. These sites are legally operating within the industry and provide a substantial range of casino games. In addition, Canadian gamblers have the option of enjoying online casino games through offshore destinations that are licensed and regulated to provide services to players around the world. It is not against the law in Canada to engage in online gambling as long as it is done through an Internet casino destination that is licensed and regulated. Participating in unlicensed or unregulated online gambling is in fact against the law, as is providing this type of illegitimate betting service to players. Since online casino gambling is legal for Canadian players, the hard part is making sure you restrict your gaming action to only legitimate, licensed destinations that provide adequate security and a high quality gaming experience. This is another area that our guide can be quite useful to you. Our team of industry analysts has collectively vetted each Canadian online casino listed on this page, and has verified their legitimacy, quality and reputation within the industry. You will see below some of the criteria we look at to determine a brand's eligibility to be included in our guide. Sports betting is much more accepted in Canada than some other nations, such as the USA. In fact, there are multiple locally based online sportsbooks licensed by the Canadian government. Currently there are some regulatory restrictions on sports betting action offered by local online sportsbooks, however there are efforts underway to remove those restrictions and expand the wagering options available to bettors. In addition, there are a number of legally sanctioned offshore Canadian sportsbooks that welcome Canadian sports fans who are interested in placing wagers on their favorite sports teams and events. There are no laws in place within Canada's criminal code that prohibit residents from engaging in this type of betting entertainment as long as participants are of legal age and do not place bets at any unregulated or illegitimate sports betting sites. This page will provide you with our top recommendations for secure, legal and high quality online sports betting destinations. As with casino gambling, each province in Canada has the right to embrace or reject online poker for their region. Provincial jurisdiction is in place for Canada based online gambling. There are also no laws prohibiting Canadian residents from enjoying online poker that is offered through legally licensed offshore poker rooms. These sites hold licensing credentials and certifications from other countries where online poker has been legalized. The legal Canadian online poker rooms you see listed on this page have each been placed through a very intense review process by our team of professional industry analysts. Each of them is legally licensed and subject to regulatory oversight by a respected governing jurisdiction. They have been personally vetted by us and were found to be among the leading options for those seeking legal online poker for Canadian players. Each site accepts residents form Canada and delivers a premium poker gaming experience. Currently, online gambling falls under provincial jurisdiction in Canada. This means that each individual province is free to determine their own destiny concerning the licensing and regulation of both land based and online gambling entertainment. Because of this freedom, there are a number of online gambling sites that are licensed locally in Canada. In addition, the Kahnawake Gaming Commission operates Canadian friendly gambling brands such as Bodog, one of the most popular sites for Canadian players. In 1985, the Canadian Criminal Code was modified to allow gambling at the discretion of each individual province. According to the nation's criminal code, it is not illegal to participate in online gambling at licensed and regulated online gambling sites. It is also not illegal to own and operate an online gambling site within Canada provided that the province in which it is based allows online gambling and has approved its licensing. Where things get a little murky in Canada's online gambling laws is when it comes to offshore betting. As of yet, Canada has not determined that offshore online gambling sites are off limits to Canadian residents. There is controversy as to how far Canadian laws can reach. The nation is understandably concerned about the revenue stream that goes offshore to these destinations being that it is a huge amount of money, however, Canadian law does not extend to jurisdictions of other sovereign nations. Some argue that if a business enters into a contract with, advertises to and offers services to Canadian residents, then it is subject to Canada's jurisdiction and laws. This issue has not been addressed aggressively nor has it been resolved. It just hangs out there as a 'gray area' for gambling site operators located outside of Canada's borders. Since lawmakers have not taken an official position on the matter, there is nothing preventing Canadian residents from enjoying online gambling at licensed and regulated offshore betting sites as long as they are operating legally within the jurisdiction in which they are located. There are no laws in place that prohibit players in Canada from participating in legal online gambling. The Kahnawake Gaming Commission's legal status has come under question multiple times, however since the Kahnawake Indian Reserve is considered a sovereign nation in and of itself, it is not subject to Canadian laws. This gaming commission remains as one of the most respected online gambling regulators in the industry. Unless Canada establishes specific legislation addressing offshore online gambling and its presence in the nation, Canadian players will not see any new restrictions placed upon them. It is a difficult prospect for Canada lawmakers to take on, and would require tremendous resources and effort to implement. It also may not carry a lot of public support due to the popularity of offshore online gambling among residents. As of yet, the country has not brought a case forward against any offshore gambling site, despite the fact that this issue has been debated for years (since before 2007). This demonstrates that it is not really a high priority for them. Where Can Canadian Players Find The Most Reputable Sites To Play At? That is the million-dollar question. You can be pretty sure that any locally licensed destinations within the provinces are closely regulated and monitored for fair gaming practices and financial transactions. However, when it comes to offshore gambling sites that are not subject to Canadian regulatory oversight, one must treat a little more cautiously. Among the many gambling sites out there that accept players from Canada, there are some bad seeds with a primary objective of stealing your money and/or identity. To eliminate this risk, we recommend that you rely on the input of industry professionals who can be trusted to direct you to only those destinations that are legitimately operating within the industry and that operate with high standards of integrity. Our review process is intense, thorough and unrelenting in its effectiveness to expose questionable, low quality and dangerous gambling destinations online, and to reveal the secure, high quality brands that are committed to being the best the industry has to offer. To give you an idea of what we mean, we've provided a list of just some of the elements we touch on in our process of vetting these sites. Does the site hold legal licensing and compliance certifications from a respected governing jurisdiction? How transparent are they with their credentials? Does the site's regulatory oversight include auditing of fair gaming practices and overall operations on a regular basis by third party authorities? Does the site accept CAD currency and accommodate Canadian players through their banking suite? Are payments released swiftly and accurately? Does their security profile exceed industry standards and minimum licensing requirements? What is their reputation among the online gambling community both with players and industry professionals? Is the software solution that powers their interface and gaming/betting services a reputable name with a proven track record of performance and reliability? How often does the site experience technical glitches or issues? How does the site handle player complaints and disputes? How competent, responsive and knowledgeable is their customer support staff? Do they verify identity of players so that underage gamblers are not able to register for an account? Are their bonus offers legitimate with reasonable wagering requirements? This is just a very small sampling of the items we investigate when evaluating an online gambling site for inclusion in our guide. We perform this analysis both as registered players and industry professionals for a comprehensive perspective. What Does The Future Hold For Regulated And Legalized Online Gambling In CA? While jurisdictional disputes remain between Canada and the Kahnawake Gaming Commission, there is always going to be some question as to how the government perceives offshore gambling sites since this commission is technically its own sovereign nation. As of yet, law enforcement nor the government of Canada has brought any case forward against an individual player or an offshore gambling site. The existing laws governing online gambling in Canada do so from an owner operator perspective and do not address players. We do not anticipate that the Canadian government will be keen on investing the necessary money and resources to impose an expansion of restrictions upon the online gambling industry any time in the near future. It simply has not been a priority for them despite their unhappiness at how much money is streaming overseas from online gambling. For the foreseeable future, legal online gambling is a stable presence for Canadian residents, both locally based and offshore. Keep in mind that ensuring your online gambling entertainment is restricted to only those destinations that are legally licensed and regulated is the key to not violating any existing Canadian gambling laws. As long as you walk the strait and narrow in that respect, you are free to enjoy online gambling without worry of legal repercussions.